There are so many elements to consider when learning to play guitar… You got all the scale and harmony stuff to understand and map out the fretboard with as well as songs to study and learn. 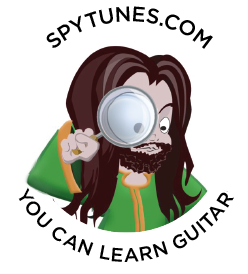 I’ve spent years teaching this, writing college courses and eventually the step by step course you find here at SpyTunes. Sometimes a student gets in touch with me before they start and ask a bunch of questions about what they will learn specifically. After bringing up various aspects, most of the time, what they really want to know is: Will I learn to play fast if I take the course? The short answer is yes, you will. The long answer is, yes you will and it’s really, really simple to understand how to achieve it! To learn to play fast, all you have to do is understand how to achieve it and then with regular practice, put the hours in. If you’re an intermediate player, expect about six months of regular practice to gain serious results. Let’s take a look at what it takes to learn how to play really, really fast. Being accurate is the most important part of building speed. It may sound like a cliche but it’s true: speed is a side effect of accuracy. What this really means is that if you lose the accuracy, you can’t increase the speed. The simple chromatic exercise is what I use for all this stuff. Assuming you can play a bit already, let’s jump straight to chromatic exercise 7. This looked really easy and perhaps it’s hard to see how playing so little, with so much space will improve your speed. The trick is, when you play this, you need to play at exactly the same time as the click. Not a little bit before or after, but right on the click. In fact, you should play so right on it that the click disappears. This is often referred to at ‘burying the click’. When you can do it, change the tempo, try both slower and faster, remember it’s not about speed now, it’s about accuracy and burying that click. To achieve this you must play with absolute focus. If you start flaming with the click, take a short break, then go again. When the tempo starts becoming silly fast, try playing exercise 1 instead, with a slight modification. Now you have one more note to fit in and in the video lesson you’ll hear that this is played legato, let’s scrap that. Instead of playing with even 8th notes, make each note as short as possible, leaving rests in between every hit. Do this by easing the pressure of the fretting hand straight away, don’t let the notes bleed into each other. Still, for the note that falls on the click, make sure it is absolutely spot on. You shouldn’t even hear the click anymore. Again, keep varying the tempo up and down. In the beginning its not about breaking speed records, it’s all about accuracy and burying that click. When you managed to not just stay with the click but actually bury it, it’s time for the second part of improving your speed and that is to play in short bursts. In this video, you’ll find two 16th notes followed by an 8th note rest. You want to bring this exercise up to speed pretty quickly. Again, the note that falls on the beat should bury the click. Now that the concept is understood you need to hone in on all 16th notes like this. In exercise 9, you play three 16th notes before you get a rest. Perhaps it would now seem to make sense to go all the way and play just a string of 16th notes but that wouldn’t be great for speed. Instead, we keep attacking the different 16th notes, maintaining the rests. This is very important and means your focus is still on playing in short bursts of speed. Exercise 51, puts the 8th note rest first, followed by two 16th notes. Now you should hear the click clearly as it falls just after you played your last note. This is without a doubt much more difficult than previous exercises. Finally, in exercise 52, we play three 16th notes. Whenever the rest appear, you should hear the click. Make sure the click fits in with your 16th notes. It’s should sound like an even stream of notes, just the first one being a click, the next three being you. As long as you do this: 1. Bury the click with your accuracy and 2. Play in short bursts, there is only one thing left to do and that is to regularly practice. How often I hear you ask, well, every day I think is a great plan. But not for more than 10-30 min. You could perhaps do two sessions in a day if you really want quick results. What definitely won’t work is to do this just once a week. The best way to think about becoming a fast player is to compare it to how athletes practice. They do it every day, measure their results and keep going. Never has this been truer than when aiming to become a quick player. I normally don’t like comparing sports to music as you can’t measure success in the same way but when it comes to playing fast, the similarities are striking. You’ll need discipline, regular practice and notating your results. Oh, and don’t forget, speed isn’t everything. If you practice accuracy and speed too much, as in, much more than anything else, you’ll risk becoming a stiff, boring and unmusical player. Saying this, it sure is nice to be able to play fast. It’s one of those boxes that is great to tick, if for nothing else, being confident that playing fast is not going to be a problem for you is a good confidence builder. In the step by step courses, I go into more depth about what else the chromatic exercise can do for you, how to vary them to make you a more accurate and faster player. Should playing fast be very important I recommend taking two new lessons a week from the course as well as practice the chromatic exercises every day in sessions of no more than 10-30 min. It would be very irresponsible of me to talk about speed practice and not mention RSI(repetitive strain injury). So students get obsessed with these exercises as they are so efficient and the results come quickly that they end up practicing them too much. If you do you risk hurting yourself. Think about it as if you’re taking your fingers to a gym. Do that too often and for too long and you may actually injure yourself. This can be a disaster for your playing as once you develop RSI, it won’t go away easily. Follow these guidelines and you could soon be playing with blistering speed, just remember to practice other things as well. Being Hussein Bolt on guitar is impressive but it’s not everything.